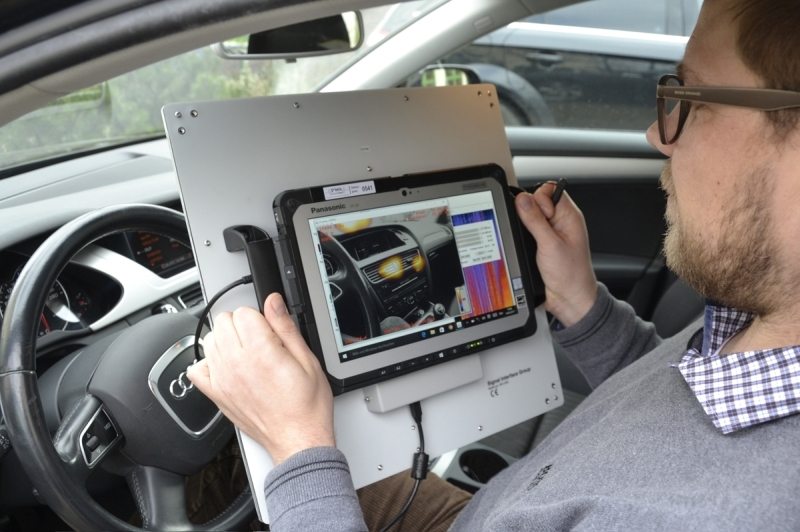 The acoustic camera AcoustiCam® is an efficient tool for localizing and separating sound sources in no time. 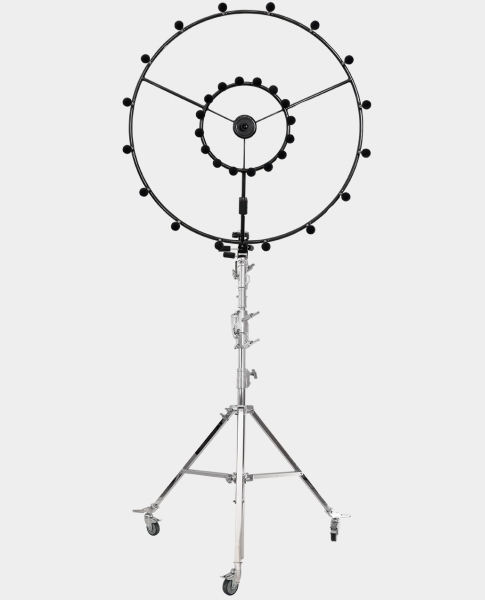 Simultaneous measurements with a large number of microphones (microphone array) are carried out followed by subsequent processing of the recorded microphone signals through an analysis software. 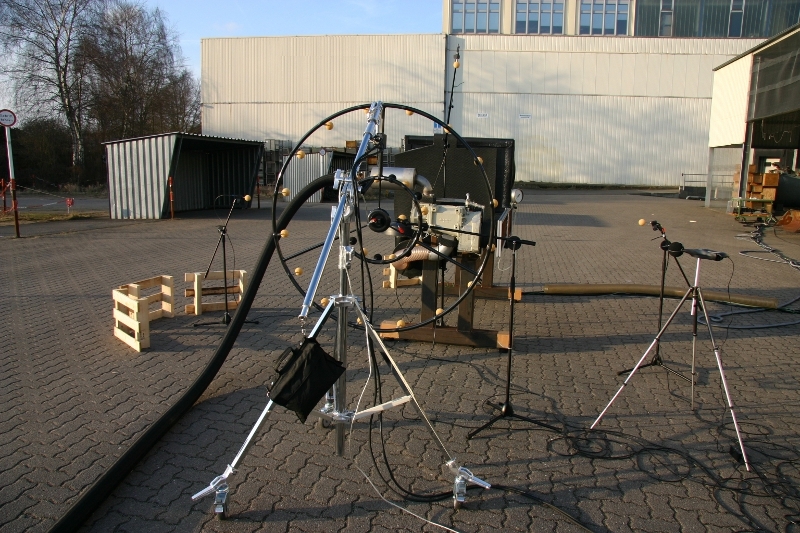 To visualize the sound situation – as in the case of applying an infrared camera – a photograph of the test object is laid underneath the localization result. 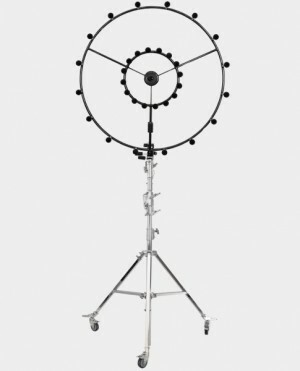 When tracking down sound sources during acoustic investigations of complex objects, conventional measurements with a single or few microphones often yield dissatisfying results. This problem can be solved with the method applied by the measuring system AcoustiCam®. The simultaneous measurement with a large number of microphones allows the exact localization and separation of sound sources in no time. 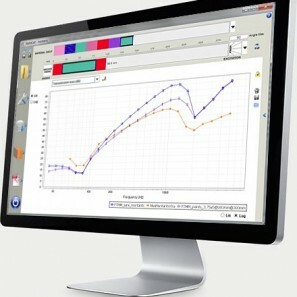 Localizing sound sources with the measuring system AcoustiCam® is done by means of the Beamforming technique. The functionality of this technique can be explained by looking at the working principle of an ellipticle concave mirror (see Principle of AcoustiCam®). For localizing sound sources, the Gesellschaft für Akustikforschung Dresden mbH offers two different camera systems. 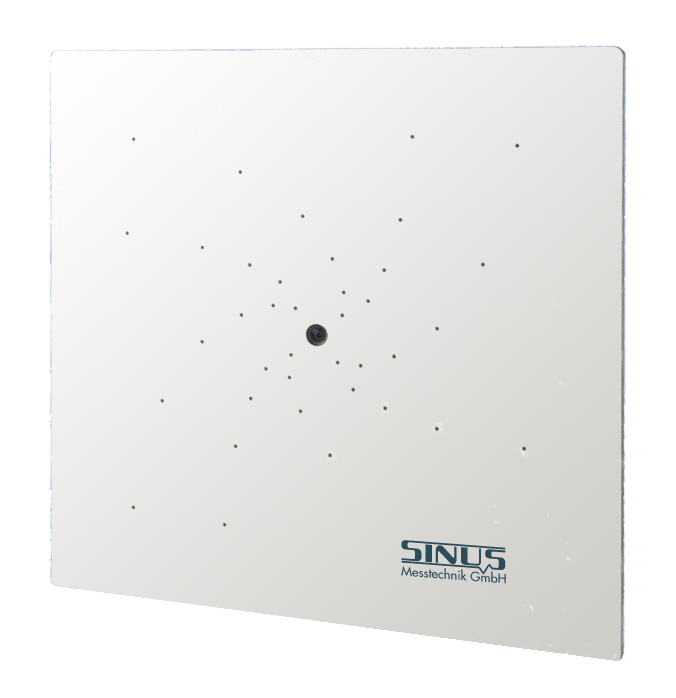 The system AC100 is a small and handy acoustic camera with the dimensions 40 cm x 40 cm. 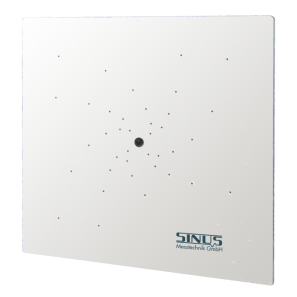 In combination with an integrated DSP, this acoustic camera can by ideally applied as compact handheld mobile microphone array that offers you a maximum flexibility when acoustically investigating on-site and in the laboratory. 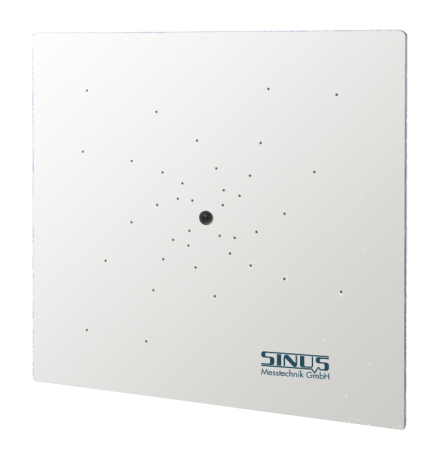 The system AED 7000 is a conventional stationary microphone array with the dimensions 1,3 m x 1,3 m, that is connected for data aquisition purposes to a compact multi-channel platform with integrated PC, on which the Beamforming calculation are carried out. Due to its state-of-the-art microphones in MEMS technology with integrated AD converters and 51.2 kHz sampling rate, together with an integrated measurement data processing unit in the latest DSP technology, the AC100 is now affordable for a wide range of users. The complete integration in the array, with only one USB interface for data and power supply, allows a convenient mobile use with any Windows PC. The AC100 is a compact and very easy-to-use acoustic camera for standalone applications. 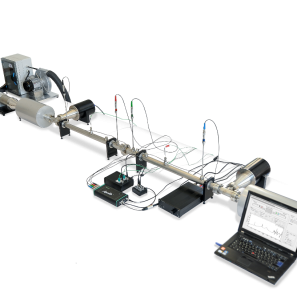 Because of its high performance, simple operation and fair price, the AC100 is suitable for a wide range of applications in research and production. The AC100 is supplied either as pure hardware + Windows driver for custom development or bundled with the BeamformX application software from OptiNav. 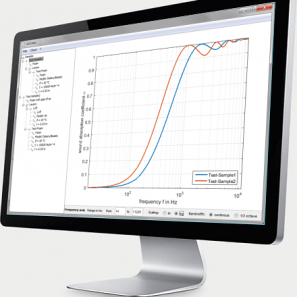 BeamformX uses an advanced new evaluation algorithm, the Quantitative Beamforming. Compared to conventional Beamforming methods, Quantitative Beamforming works faster, has a higher dynamic range and can resolve more details spatially and temporally. Even low-frequency components of e. g. 50 Hz can be localized by means of this algorithm even with a small array diameter, without the necessity of switching to Acoustic Holography. Quantitative Beamforming was developed by Robert P. Dougherty, OptiNav Inc USA. 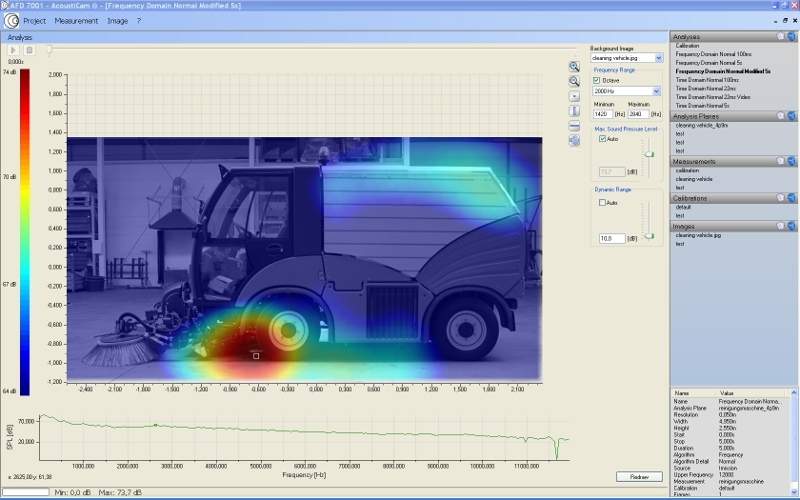 The stored raw data can also be used in postprocessing with the SAMURAI software from SINUS Messtechnik. The AC100 can be supplied either as pure hardware with Windows driver (API). 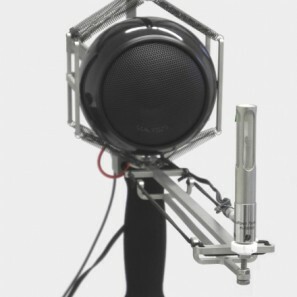 The system AED 7000 is an acoustically transparent carbon ring array on a mobile tripod with boom. It can be flexibly positioned and is especially suited for investigations a vehicles and machinery. The micophone arrangement was numerically optimized and offers a high signal-to-noise ratio and a high spatial resolution at the same time. 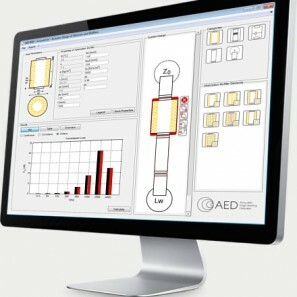 The acoustic camera AED 7000 is supported by the analysis software AED 7001. Thereby, various classic and novel Beamforming algorithms in the time domian and the frequency domain can be applied (e. g. Orthogonal Beamforming for separate localization of independent sound sources, elimination of channel noise to increase signal-to-noise ratio, see Performance of AcoustiCam®). Besides the mapping of sound situation as colored, two-dimensional, absolute distribution of sound pressure level together with the determination of spectra as well as spatial profiles of the sound pressure level, the source signal can be generated and auralized (listening). Also trigger signals, e. g. by light barriers, can be evaluated. The software supports arbitrary microphone arrangements and can carried out in Live Mode (continuous localization of sources) or Postprocessing Mode (arbitrary repetition of analysis by post-processing with variable computational parameters without re-measurement, e.g. choice of algorithms, subsequent deactivation and weighting of single channels).